Department of Chemistry, University of Tennessee, Knoxville, USA. Received September 10th, 2010; revised January 1st, 2010; accepted January 5th, 2011.
compares the nanomechanical responses of these receptors with rifampicin on a single platform. moval of many unwanted xenobiotics possible . tabolizing approximately 50% of drugs used today [3,4]. choose to use the term PXR. pocket, which can expand to fit a variety of sized ligands. other nuclear receptors and that allow its expansion . as a xenobiotic sensor . creases or decreases the metabolism of another [3,14]. and skew the prescribed therapeutic dose. PXR has been developed and is demonstrated within. potentially could be employed in the field. lized proteins in the low-to-sub-nanomolar range . 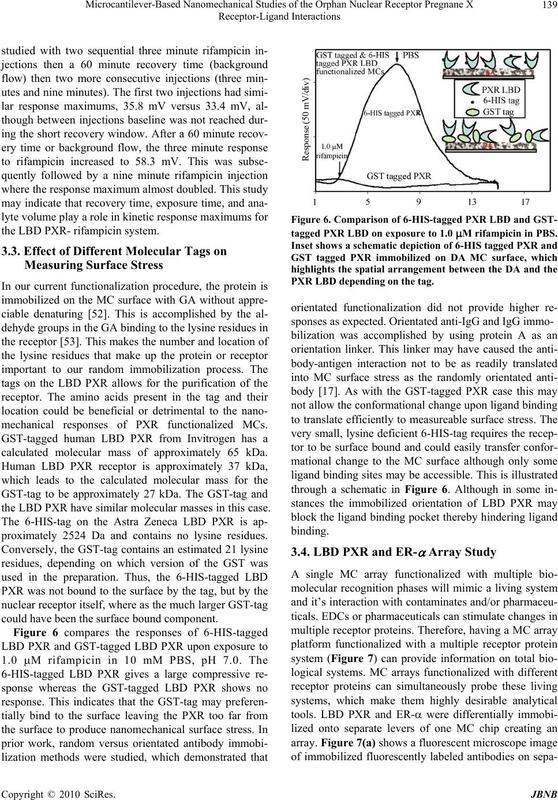 when utilizing differently tagged PXR-receptors. were purchased from Sigma-Aldrich Chemical Co.(St.
surfaces on MCs is described in detail elsewhere . a gold surface with nanosized, colloid-like features. ~150 nm in these studies. pillary coating method described in detail elsewhere . er for 1 hour at room temperature. of the true response curves . Figure 1. Schematic of laser array setup with a single PSD. solution was prepar ed in acetone then dil uted with PBS. often use a VCSEL setup [36-38]. when compared to a similarly sized immobilized protein. and ER- interaction with rifampicin. and possible drug-drug interaction predictions. which include activating CYP1A1/2 enzymes [42-45]. quential injections of 1.0 M rifampicin wi th a CV of 6.32.
to immobilized PXR and ovalb umin (blank). binds to certain EDCs with different affinities [50,51]. 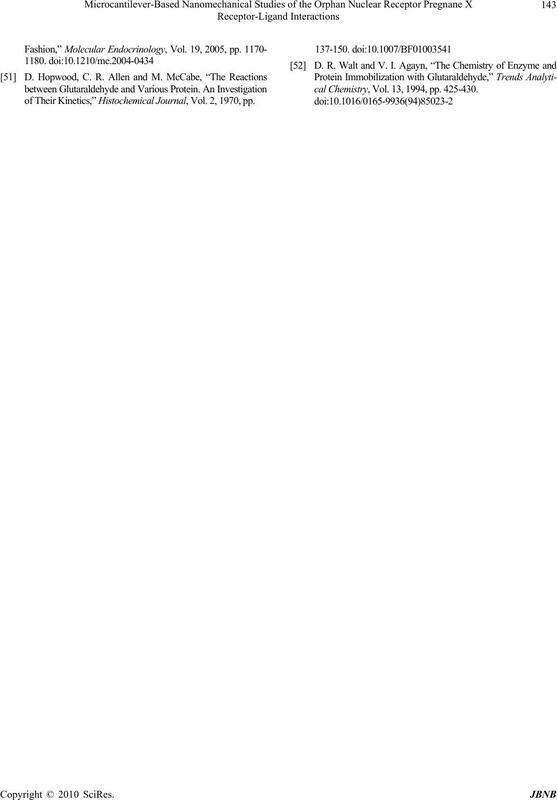 1.0 M rifampicin are shown. posed to 1.0 M nonylphenol and rifampicin. compared to the EDCs (see inset). concentration in Figure 5 of 0. 1 nM ) i n c on cent rat i o n.
line was not always reached with shorter recovery times. the LBD PXR- rifampicin system. 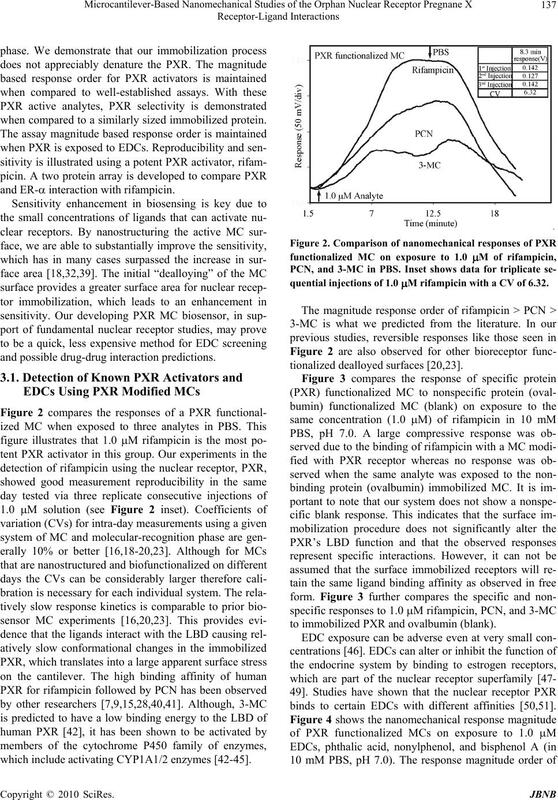 mechanical responses of PXR functionalized MCs. calculated molecular mass of approximately 65 kDa. the LBD PXR have similar molecular masses in this case. proximately 2524 Da and contains no lysine residues. could have been the surface bound component. tagged PXR LBD on exposure to 1.0 M rifampicin in PBS. PXR LBD depending on the tag. anti-IgG. (a.) FITC-anti-IgG on lever 3 is excited by 488 nm laser. 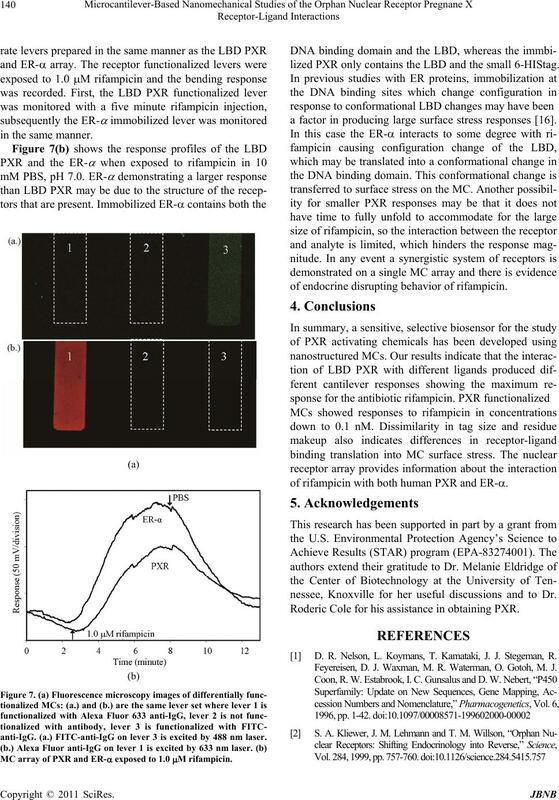 MC array of PXR and ER- exposed to 1.0 M rifampicin. lized PXR only contains the LBD and the small 6-HIStag. a factor in producing large surface stress responses . of endocrine disrupting behavior of rifampicin. 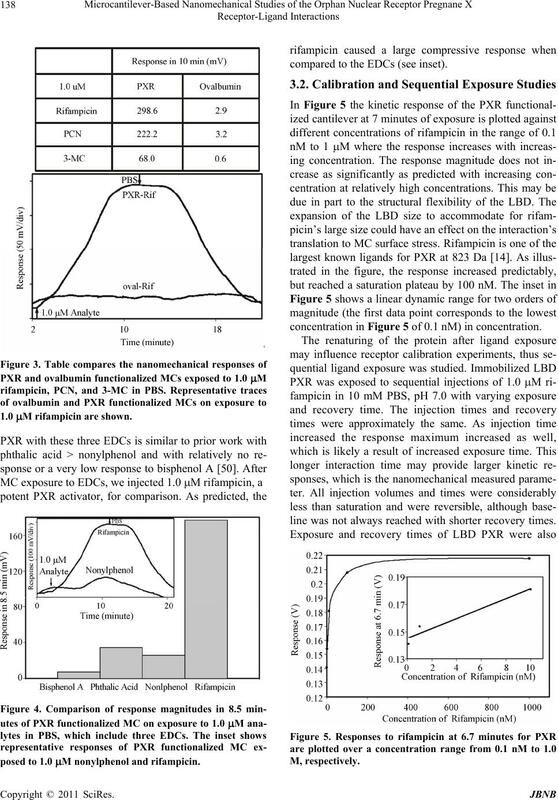 of rifampicin with both human PXR and ER-. nessee, Knoxville for her useful discussions and to Dr.
Roderic Cole for his assistance in obtaining PXR. D. R. Nelson, L. Koymans, T. Kamataki, J. J. Stegeman, R.
Feyereisen, D. J. Waxman, M. R. Waterman, O. Gotoh, M. J.
kins, A. Daly, S. D. Hall, P. Maurel, M. Relling, C. Brimer, K.
Yasuda, S. A. Wrighton, M. Hancock , R . B . K i m, S . Str o m , K .
 S. A. Kliewer, J. T. Moore, L. Wade, J. L. Staudinger, M. A. Novel Steroid Signaling Pathway,” Cell, Vol. 92, 1998, pp. B. Blumberg, W. Sabbagh, Jr., H. Juguilon, J. Bolado, Jr., C.
Development, Vol. 12, 1998, pp . 3195-3205.
tion,” Proceedings of the National Academy of Sciences, Vol. R . E. Watkins, G. B. Wisel y, L. B. Moore, J. L. Colli ns, M. H.
Lambert, S. P. Williams, T. M. Willson, S. A. Kliewer and M.
 L. B. Moore, J. M. Maglic h, D. D. McKee, B. Wisely, T. M.
Molecular Endocrinology, Vol. 16, 2002, pp. 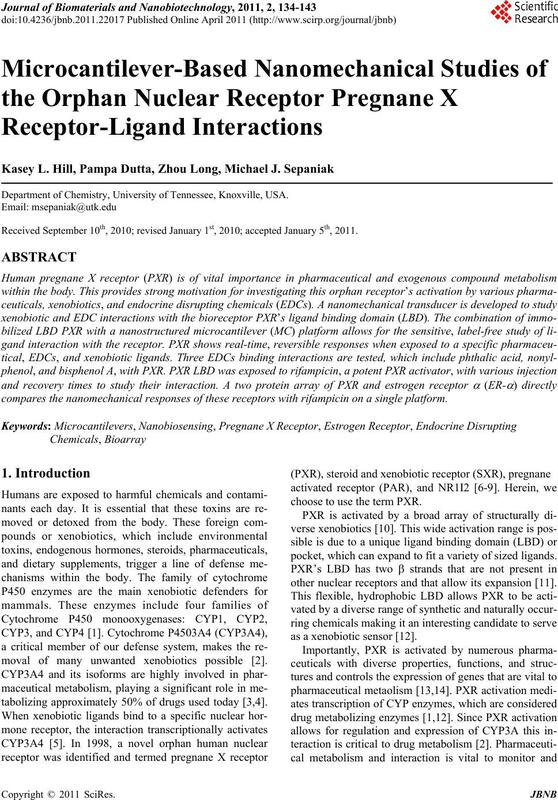 977-986 .
clear Receptor Signaling, Vol. 7, 2 009, pp. 1-21.
tabolism,” Endocrine Reviews, Vol. 23, 2002, pp. 687-702. J. E. Chrencik, J. Orans, L. B. Moore, Y. Xue, L. Peng, J. L.
Collins, G. B. 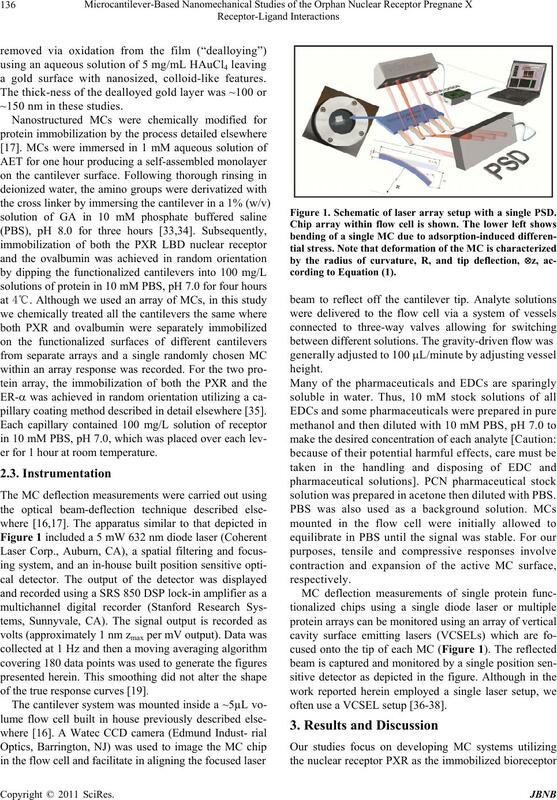 Wisely, M. H . Lambert, S. A. Kliewer and M. R.
crine Disrupting Chemicals,” Lab Chip, Vol. 7, 2007, pp. lytica Chimica Ac ta, Vol. 625, 2008, pp . 55-62. NanoBiotechnology, 1, 2005, pp . 237-244.
levers,” Applied Physics Letters, Vol. 66 , 1995, pp. 1695-1697. J. Fritz, M. K. Baller, H. P. L ang, H. Rothuizen, P. Vettiger, E.
Science, Vol. 288, 2000, pp. 316-31 8. S. A. Jones, L. B. Moore, J. L. Shenk, G. B. Wisely, G. A.
 S. J. Shukla, D. Nguyen, R. MacArthur, A. Simeonov, W. J.
Frazee, T. M. Hallis, B. D. Marks, U. Singh, H. C. Eliason, J.
nologies, Vol. 7, 2009, pp. 143-169.
rial A, Vol. 82, 1909, pp. 172-177 . Springer, Berlin, 2006, pp. 299-321. 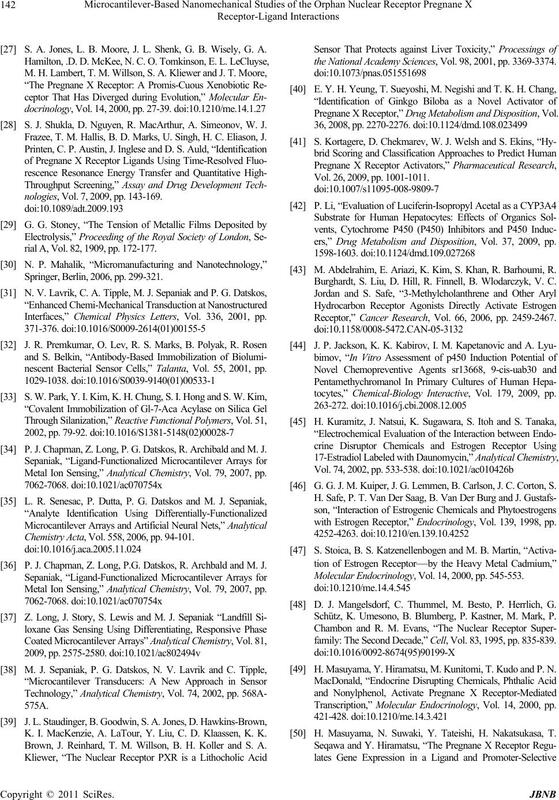 Interfaces,” Chemical Physics Letters, Vol. 336, 2001, pp. nescent Bacterial Sensor Cells,” Talanta, Vol. 55, 2001, pp. P. J . C ha pm an , Z. Long, P. G. Datskos, R. Archib ald and M. J. Metal Ion Sensing,” Analytical Chemistry, Vol. 79, 2007, pp. Chemistry Acta, Vol. 558 , 2006, pp. 94-101. P. J. Chapman, Z. Long, P.G. Datskos, R. Archbald and M. J.
K. I. MacKenzie, A. LaTour, Y. Liu, C. D. Klaassen, K. K.
Brown, J. Reinhard, T. M. Willson, B. H. Koller and S. A.
the National Academy Sciences , Vol. 98, 2001, pp. 33 69-3374. Pregnane X Receptor,” Drug Metabolism and Dispo sition, Vol. Vol. 26, 2009, pp. 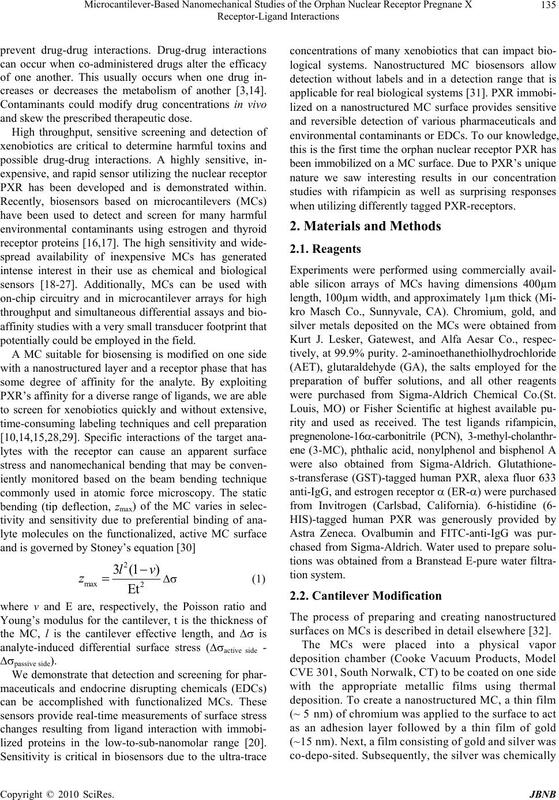 1001-1011.
ers,” Drug Metabolism and Disposition, Vol. 37, 2009, pp. M. Abdelrahim, E. Ariazi, K. Kim, S. Khan, R. Barhoumi, R.
Burghardt, S. Liu, D. Hill, R. Finnell, B. Wlodarczyk, V. C.
Receptor,” Cancer Research, Vol. 66, 2006, pp. 2459-2467.
tocytes,” Chemical-Biology Interactive, Vol. 179, 2009, pp. G. G. J. M. Kuiper, J. G. L emmen , B. Carlson, J. C. Cor ton, S .
with Estrogen Receptor,” Endocrinology, Vol. 139, 1998, pp. Molecular Endocrinology, Vol. 14, 2000, pp. 545-553 . D. J. Mangelsdorf, C. Thummel, M. Besto, P. Herrlich, G.
Schütz, K. Umesono, B. Blumberg, P. Kastner, M. Mark, P.
family: The Second Decade,” Cel l, Vol. 83, 1995, pp. 835-839. H. Masuyama, Y. Hiramatsu, M. Kunitomi, T. Kudo and P. N .
Transcription,” Molecular Endocrinology, Vol. 14, 2000, pp. 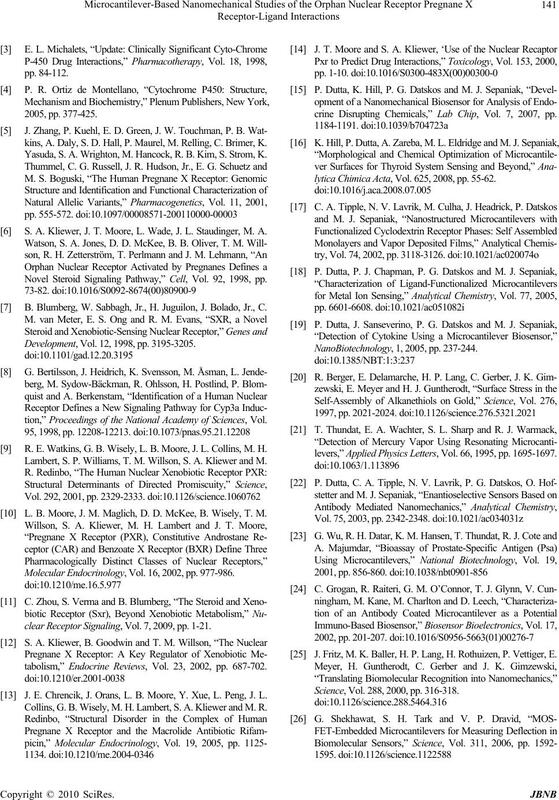 H. Masuyama, N. Suwaki, Y. Tateishi, H. Nakatsukasa, T.
of Their Kinetics,” Histochemical Journal, Vol. 2, 19 70, pp. cal Chemistry, Vol. 13, 1994, pp . 425-430.